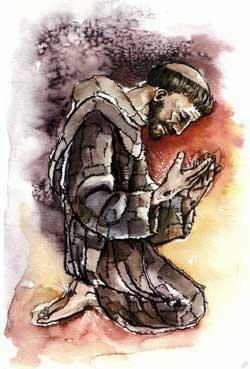 “The Canticle” is “the expression that takes place in the night of the soul.” (Eloi Leclerc, OFM). This story “The Language of the Soul’s Night” is from Eloi Leclerc‘s The Canticle of Creatures(now out of print) as quoted in St. Francis and the Foolishness of God by Marie Dennis, Joe Nangle, OFM, Cynthia Moe-Lobeda and Stuart Taylor. I read this story every Oct. 4, the feastday of St. Francis of Assisi, to remind myself that Francis is more than the “saint of the birdbath” and what it means for me to be a Franciscan. Francis sought occasion to love God in everything. his mind soared aloft to the life-giving source and cause of all. embrace Him who is all-desirable. as in so many rivulets. he exhorted them all to praise God.